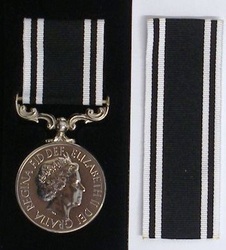 The main, and simplified qualifying criteria are that the applicant has to have served a minimum of 20 years on operational duties in HM Prison Service, and to have been serving on or after 29th April 2008 – those who retired or resigned before that date, even if they served the required years, are ineligible. 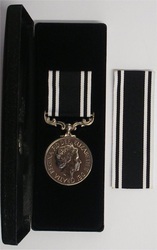 The medal (shown here) should be worn immediately after the Royal Fleet Auxiliary Service Medal – which means it is worn after all other long service medals (including the Ambulance Service LS & GCM). At present Medway Medals is the only stockist of the ribbon for this medal outside of the manufacturer and the Royal Mint, so if you have received the medal and require it to be mounted with your other medals (if you qualified for this you should also have least the 2002 Jubilee! ), or even your ribbons for your uniform, please contact us. 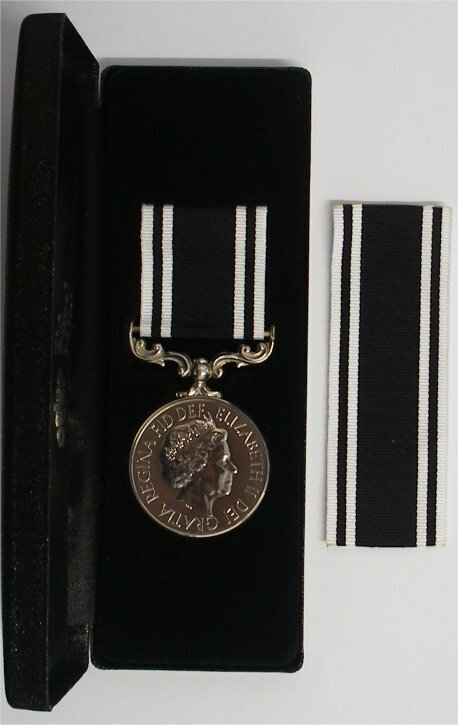 Full details of the official Royal Warrant (Notice 1282692) can be found in the London Gazette of Monday 17th January 2011, Issue 59672, page 616.